FAMILY: 4th brother, friend were to have been on trip. 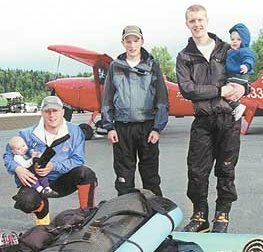 Kathi Strawn sat in the living room of her Eagle River home Tuesday with its brightly colored quilt on the wall and her dead sons' recovered climbing gear on the carpet and considered a question put to her: How is she going to get through the loss of three children in a single fall on Mount Foraker? "Our religion, our faith is what is keeping us together," she said. "There is eternal life for those who are worthy. ... When we get to the other side, they'll be there." Across the room, her husband, Jon, paused in his task -- unpacking a small yellow duffle filled with clothing, food and safety equipment returned to him with his sons' bodies. He asked to have the question and answer repeated, then seconded his wife's sentiment. This is a strong Mormon family, composed in the face of devastation that would sink others. "What else can you do?" Kathi Strawn said. "I've got three other kids who depend on us to stay strong." She also has two young widowed daughters-in-law and three grandchildren without fathers. On Monday, a National Park Service helicopter crew recovered the bodies of Kevin Strawn, 27, Travis Strawn, 21, and Colby Strawn, 15, from 8,500 feet up Foraker in the Denali National Park and Preserve. Park rangers believe they fell sometime Thursday from the 10,500-foot level, swept off the mountain by an avalanche, perhaps. No one is sure what really happened. The trio, all experienced climbers, planned an assault on Mount McKinley after finishing Foraker. A fourth Strawn brother, Brad, planned to climb with them, but he is to be married later this summer and decided he was too busy to go, Kathi Stawn said. "The plan had been for all four brothers to climb it together." Brad, who is a medical student on the East Coast, was due home Tuesday night. The Strawns have two daughters. The family moved to Anchorage from Utah about 10 years ago and continued a love affair with the outdoors. Everybody hiked and climbed, camped and snowboarded and anything else they could think of, summer or winter. All four brothers had climbed Mount Rainier together and peaks in the Grand Tetons and the Chugach Mountains. Kevin and Travis had both made successful McKinley climbs. Kevin in particular was crazy about mountaineering but also very safety conscious, said friends here and in Salt Lake City. He called his construction company Peak One Enterprises. "He was so excited about climbing that he would talk so fast he would almost hyperventilate," said Jason Belknap, who knew Kevin from seventh grade in Salt Lake City. He spoke Tuesday to the Salt Lake Tribune. "Climbing was his life," Belknap said. "He was always so cautious. If there was a guy you wanted with you in the mountains, it was Kevin. ... He would show you how everything worked just before going, to let you know everything would be OK.
"There was something about Kevin in the outdoors where you never questioned him. He had a lot of confidence and you felt secure with him." Garry Lodoen, a relatively novice climber who planned to go with the Strawns, agreed. "He was a fantastic climber, very meticulous, to the point where he was always prepared for everything." Lodoen met Kevin in classes at the University of Alaska Anchorage. Kevin graduated last year with a BA in economics and was working on a master's. Lodoen was a hiker hoping to become a real mountaineer. He and Kevin hiked Bird Ridge, about 3,500 feet, a month ago. The Foraker-McKinley adventure would have been Lodoen's first big climb. "I figured it was the once in a lifetime shot with an experienced climber like Kevin," Lodoen said. "He was not a dangerous climber, not a maverick. He was very safe about everything he did. ... He said he wasn't going to let anything happen to our climbing party because he had a wife and kid at home." Lodoen said he had to pull out of the climb because he got a new job several weeks ago and couldn't take the time off. Travis Strawn, 21, was assistant manager of the Carr's bakery in Eagle River and the father of two children. He said at one time that he hoped to one day become a climbing guide. He also apparently had a fearless sense of humor, or perhaps of romance. The newspaper announcement of his engagement said he arranged with flight attendants for his intended to be the last passenger off the plane when she arrived in Anchorage on a visit from Mesa, Ariz., where she was living at the time. When she emerged, Travis, on his knees with a ring, announced over the airport intercom: "Stacy Fullmer, we have been together for four years. I think it's time to tie the knot. Will you be my bride?" Colby, 15 and in the ninth grade at Chugiak High School, played guitar in a jazz band and, like his brothers, was smart and well liked, said Pam Schurig, a family friend. He helped Kevin build a house last summer and was close to becoming an Eagle Scout, like his older brothers, Kathi Strawn said. He was also a good student, particularly adept at math, she said. Kathi said she and Colby climbed Mount Baker in Washington together. As Kathi talked about her children, friends and neighbors stopped by, some carrying casseroles, some flowers, some delivering a hug and condolences. Many were from their church. "We've had 50 calls today," Kathi said, "offering their support in any way they can." Kevin and Travis were just getting started in life. No one knows yet if they had life insurance, Kathi said. "You don't think this is going to happen until you're old." Friends have set up accounts at two banks to help pay funeral costs and perhaps contribute to the children's education, she said, at Credit Union 1 and Alaska USA. As for losing her sons, as terrible as it is, Kathi said she has no doubt they will all be together again. "They believed in living life to the fullest," she said. "And if you don't take chances, you don't really live. Reporter Sheila Toomey can be reached at stoomey@adn.com or 907 257-4341. Three Anchorage-area brothers who died while mountain climbing in Denali National Park and Preserve were attempting Mount Foraker under conditions bad enough to turn back other climbing teams. Kevin Strawn, 27, Travis Strawn, 21, and Colby Strawn, 15, had hoped to complete a 17-day trip to the summits of both Foraker and nearby Mount McKinley, the tallest peaks in the Alaska Range. They were on the third day of their climb Thursday up the southeast ridge of 17,400-foot Foraker when they fell to their deaths. Park rangers described snow conditions as so unstable other groups that recently tried to reach the summit decided to turn around. The Strawns radioed the base camp on Kahiltna Glacier on Thursday to report they were at 10,500 feet. Officials speculate that later the same day they fell almost 2,000 feet down a slope, coming to rest at 8,500 feet. Their bodies were recovered Monday evening by a National Park Service rescue helicopter. The cause of the accident is unknown, but avalanche debris was spotted in the area. The southeast ridge route is steep and prone to avalanches, said Daryl Miller, Denali's south district ranger. No climbers have reached the summit via that route in a couple of years, he said. The two older Strawn brothers were experienced mountaineers and had reached the 20,320-foot summit of McKinley, North America's highest peak, in 1999. "They had enough experience to make good decisions," said Miller, who works out of the park's Talkeetna ranger station. "There are some things we'll probably never know for sure, including what actually caused the fall." The brothers were the only climbing party on Foraker last week, so there are no witnesses to what happened. They were found roped together on top of the snow and appear to have tumbled down a slope that Miller estimated to have an angle of about 40 degrees. That is in the range of slopes most prone to avalanche. It's common for groups of climbers to rope themselves together for safety, Miller said, but that tactic might have been a problem because the snowpack on Foraker is poor. Climbers roped together usually drive stakes, called pickets, into the snowpack and tie off to protect against falls. But the snow has been soft recently. "My guess is because the snow conditions were really bad, pickets would be something you couldn't use," Miller said. "If you are not using pickets, just climbing, then if a person falls and you're roped together, you're pretty much getting drug and you can't stop." Just two weeks ago, three climbers were killed and four critically injured on Oregon's Mount Hood after one member of a roped group fell, taking his rope team with him and starting a chain reaction that swept two other rope teams off the mountain's upper slopes and into a crevasse. Mount Hood is considered a relatively easy climb. Only about 40 people a year attempt to reach Foraker's summit, the third highest point in Alaska. The successful summit rate is only about 30 percent. This year 10 of 40 climbers have made it. The Strawns, the last group to attempt Foraker this season, were ambitious, Miller said. "Very few people climb both Denali and Foraker in the same year," he said. "It's just really hard to do." The deaths are the first on Foraker since 1992. A total of 17 people have died while climbing it since the first fatal accident in 1976. Most of the seven fatal episodes were caused by avalanches, Miller said, and 11 of the bodies were never recovered. Colby Coombs survived a 1992 avalanche near Foraker's summit that killed his two climbing partners. Tuesday was the 10th anniversary of that tragedy. "Mountaineering is a very serious sport that attracts people who take things very seriously but there is risk," said Coombs, now owner of a Talkeetna mountain climbing school and guide service. "Even trying to manage it as best as possible, there are going to be times when you miss the clues or there are no clues." Coombs said the Strawns had passed the steepest, most challenging part of Foraker's southeast ridge. But the rest of the way is still tough. "It could have been a little tender spot, a particular ditch or depression on the ridge they were traveling on that has wind-deposited unstable snow," Coombs said. "It doesn't take much to knock you off your feet." The condition of the snowpack on the mountain can change every couple hundred feet. Miller said recent climbers described the snow as unconsolidated and slushy. "That's been a red flag for several other groups that turned back," Miller said. Doug Fesler of the Alaska Mountain Safety Center said it is easy to trigger an avalanche when crossing wet snow on the surface of a steep slope. "The message on this thing is even very small slides or small things like tripping can have big consequences," he said. "Don't ever be afraid to turn around. A lot of guys have made it up that ridge to 8,500 or 9,500 feet and turned around."